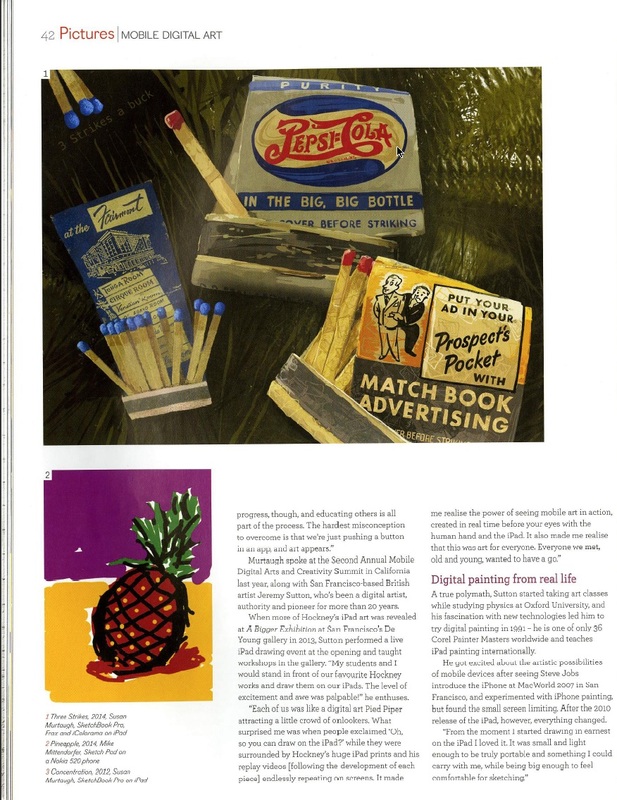 This article, written by Carol Cooper, was published in the March 2015 issue (#155) of Shots magazine and is reproduced here with kind permission of Shots magazine. 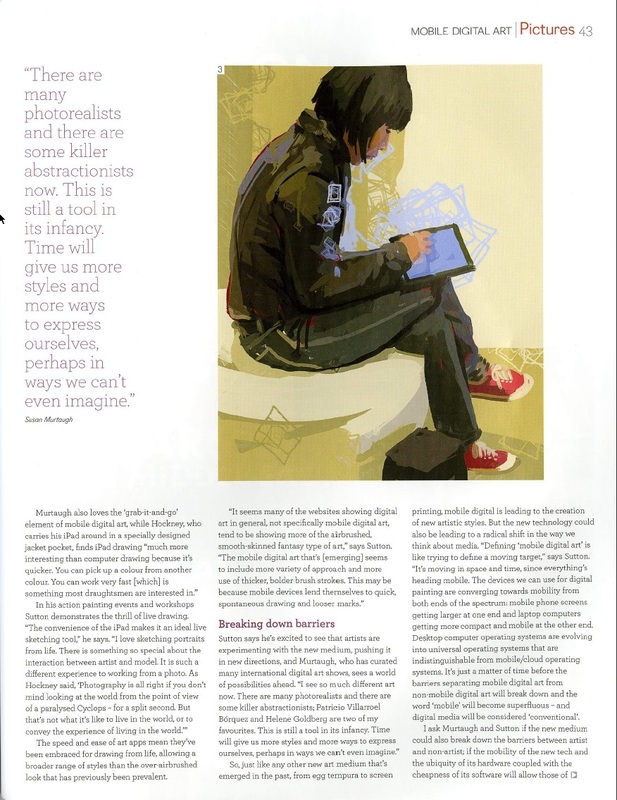 Thank you, Shots magazine, for allowing me to share this. 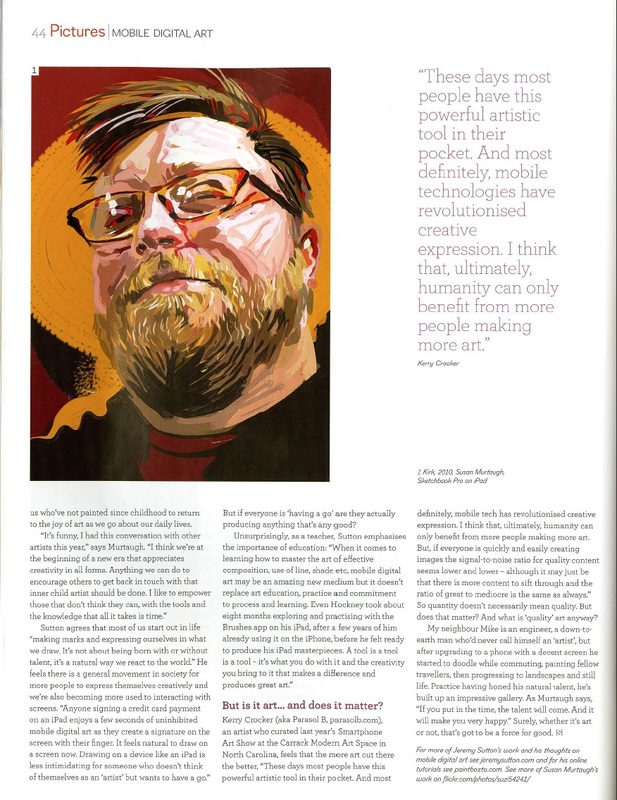 This article, which features several different iPad artists (Susan Murtaugh, Kerry Crocker and myself), addresses the impact mobile digital art is having on breaking down barriers between “artist” and “non-artist”, giving everyone a powerful creative tool to enjoy. 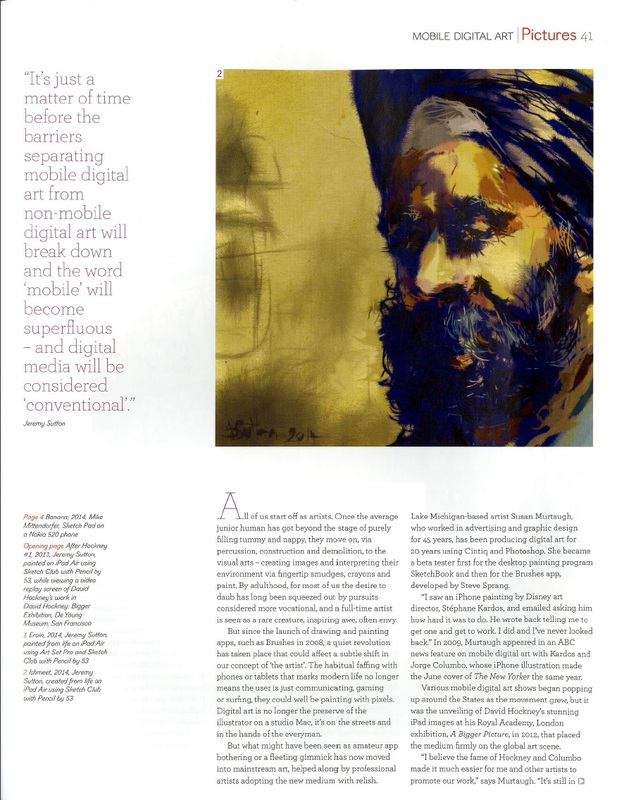 Thank you, Carol, for writing such a great article and stimulating me to share my thoughts on this exciting new world of mobile digital art! In preparing for this article Carol asked me a lot of questions. She didn’t have room to include all my answers (some of which were quite long) so I have shared my full responses in an essay called Thoughts on Mobile Digital Art that is published on this web site. 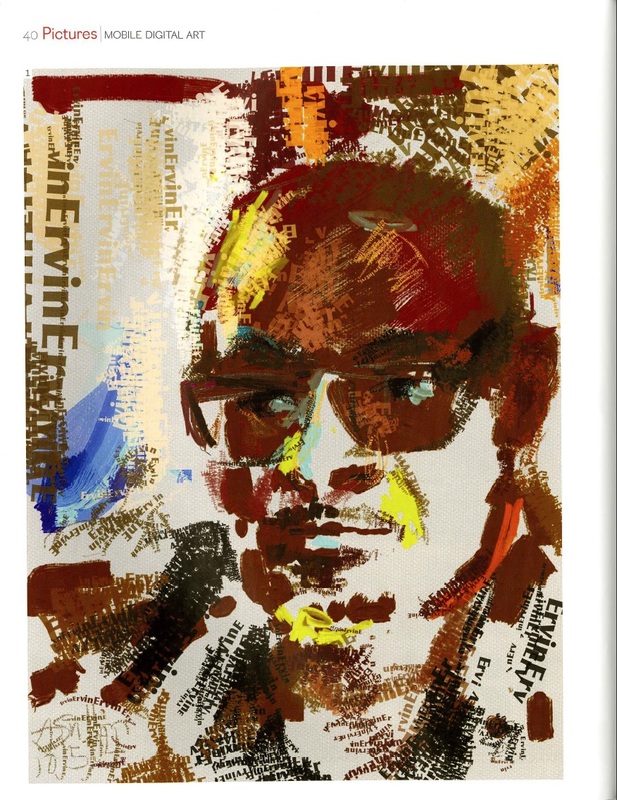 If you’d like to learn more about making art on your iPad then please also visit my Mobile Art Tools page and my Paint on the Go! workshop page. 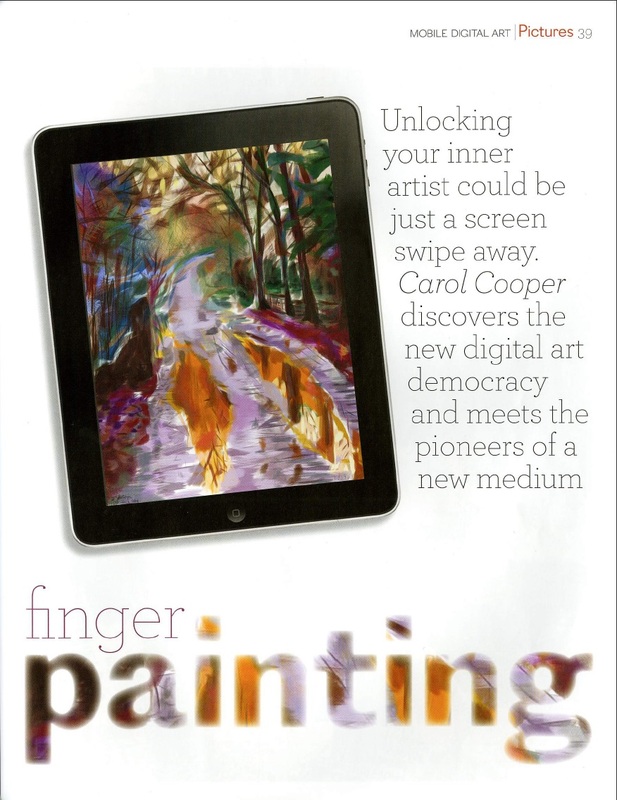 I teach iPad painting internationally and for a full listing of my upcoming classes please visit my workshops page. If you find the text shown in the scanned article pages above is too small to read, then first try to zoom in using your Cmd-+ (Mac) or Ctrl-+ (PC) keys. I have tested that on Safari, Chrome and Firefox and it seems to work. Failing that then right click on the images and download them onto your computer. They are relatively large jpeg images and you should be able to read the text easily when you open them up on your computer. Thank you, Susan (Murtaugh), for so kindly scanning your hard copy of this article and providing the digital files that enabled me to post this here before I received my copy in the mail. Que bueno sería clases tenerlas en idioma Español . Como también los artículos relacionados.